Walking into the nightclub reminds Jacob of walking into a bee hive. Clubgoers buzz to and from the bar while others dance to the hypnotic drone of eletronica. Jacob feels his chest vibrate in sympathy with every beat of the pulsing music, and it takes him some moments to adjust to the flickering lights. His prey would most likely be in either be in the VIP room or the office. After the last 36 hours, Jacob was in no mood for niceties. Two minutes alone with the guy and he'd either have the information he needed or the satisfaction of beating the stuffing out of him. Jacob felt a hand clamp like a vice on his arm and was surprised to see a hulking bouncer standing next to him. It appears he was expected. Want to draw it out yourself? Use the 8.5×11 map as a guide. Want to simply drop the map on the table and play? Use either the 24×36 full map (if you have access to a plotter printer) or print the tiled version on regular paper and assemble a full-size version yourself in a matter of minutes. Both versions are scaled at 1 inch equals 5 feet. In addition, each floorplan also comes in versions without room labels and without furniture. Note: All floorplans are rendered in black and white. All maps are created by an architectural drafter using AutoCAD. This gives all of the maps the realistic feel that your players crave. Grab a copy of Modern Floorplans: Average Nightclub today, and keep an eye out for future releases! 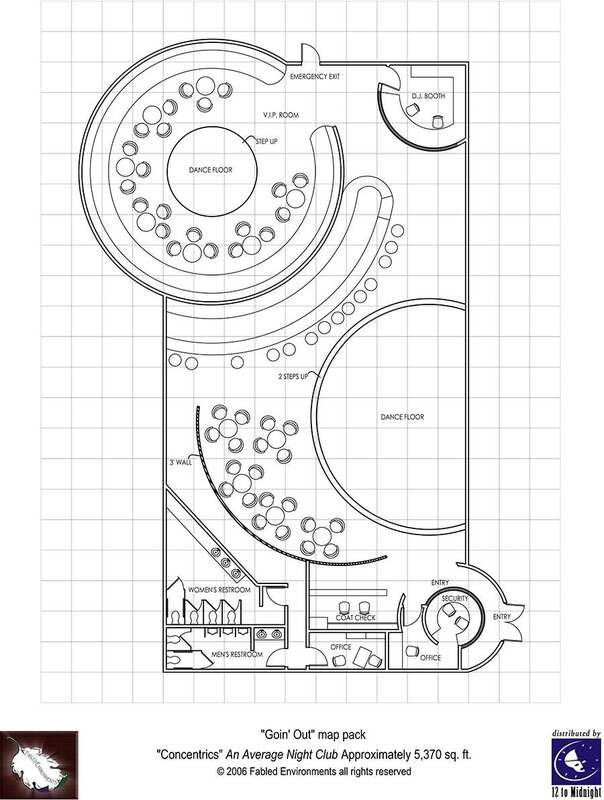 Given its interesting design, this floorplan suits any type of club, from a gentlemen's club to a rave club. The floorplan includes a cashier and security booth, office, raised dance floor or stage, bar, DJ booth, VIP room, and emergency exit / private entrance. This title was added to our catalog on June 07, 2006.